This time of the year, there’s a lot of talk about what we want to change about ourselves and our lives. Everyone is setting goals and making resolutions for the new year. Of course, we all have the fear that they won’t actually work. I have a story to share with you about setting and achieving those goals! I decided in 2016 to make a real change. In April of 2016 I began a journey to lose weight. I weighed 285 pounds. 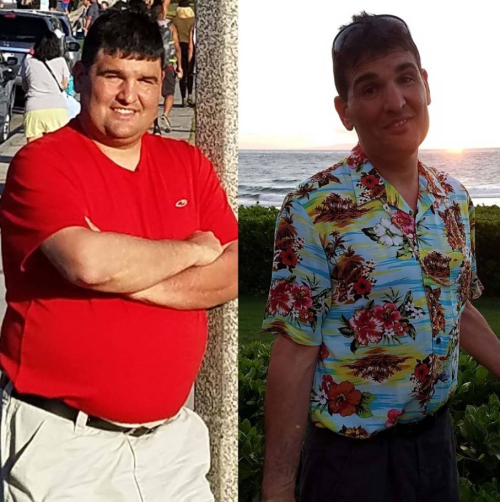 Within 3 months of setting my mind to it, I had lost 25 pounds. I can attribute most of that loss to cutting out those bowls of ice cream I’d eat late in the day. It was working! I was seeing the payoff of hard work and determination. So, naturally, I couldn’t stop there. My success up to that point jump-started things. In July 2016, I received a like request for a Facebook business page. The page belonged to someone that I knew, but not really well. I liked his Facebook page, then asked him if he wanted to have coffee or lunch with me. He told me that he was really busy with work, but if I wanted to spend time with him I could meet him at his house at 5am and go for a walk with him around our neighborhood. Didn’t know what was wrong with that guy, but I showed up anyway. When we were done he asked, “Are you coming back tomorrow?” I replied, “Why not, see you tomorrow” We walked every day for months. That friend is Chris Rotella, and he is now one of my best friends. I began to log my food each day using the MyFitnessPal. The process of logging my food helped me to track and manage my calorie intake. By January of 2017, I saw a number I hadn’t seen in 20 years. I saw a 1 at the beginning of my reading on the scale. I was down to 199.6 pounds. I honestly didn’t think I would ever see a number in the one-hundreds in my lifetime. But it had really happened! I have been quite quiet about my journey so far. Wasn’t sure if I could keep this up. Happy to report that in January of 2018 I am still at or below the 200lb mark. Getting there is one thing, staying there has been quite the journey. Once again, achieving one goal spurred me on to set and attain more goals. As of January 2017, I could only accomplish 3 push-ups in a row without stopping. I set a goal for myself to do 5,000 push ups before the end of 2017. On January 1 I could only do 3. It doesn’t take a mathematician to figure out that 3 push-ups per day wasn’t going to meet that goal. Then I kept adding little by little each day until I was able to do 20 a day, then 30, etc. By the end of 2017 I upped my push up goal to 25,000. Mind you, I had never done 100 push ups in my lifetime before January 1, 2017. I worked at it and focused on the goal. It took some determination, but I met the mark! On the last day of 2017, I had to do 540 push-ups as a final sprint to the finish line. But I had made it! I accomplished my mission and powered through 25,000 push-ups in a year. Of course, I can't let that be the end game. I have to keep adding to my target. I’ve set a new goal for myself, to complete 1,000,000 push-ups in my lifetime. I’ll have to follow through with 140 push-ups per day for the next 20 years to make this a reality. But, you know what, I’m thinking I’ll meet that goal in the same way I’ve met every other goal up to this point. I’ll keep moving forward and accomplish the daily, weekly, monthly, and yearly requirements to add up to my end goal. Now, if you’ve read up to this point, you might notice a trend. I’m not satisfied with just setting and achieving just one goal for myself. I love to continue adding to the target and pushing myself even further. This next goal is a fun one: I am going to dunk a basketball into a regulation height hoop. I want to achieve this before my high-school aged son graduates in 2019. He can dunk a basketball, and I don’t see any reason why I shouldn’t either. Of course, I’ll be back to update you on my progress toward all of my goals. If you take away anything from this, it’s that no goal is too crazy. You’ll be amazed at the snowball effect of setting and achieving your own missions. Once you see one objective get marked off the list, you’ll want to achieve more, then even more! May your 2018 end with the achievement of all the resolutions you’ve set for yourself. If I can meet my goals, I promise you can too.